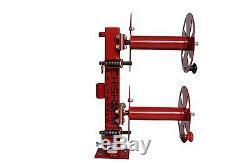 Chisolm Lead Reels provides the world with the most durable USA-made reels in the industry. We give mobile welders a user-friendly, simple solution for storing and using welding leads. A top choice in terms of quality, value and customer service, Chisholm takes pride in using American-made parts, manufacturing in-house and employing the same skilled tradesmen who use lead reels themselves. We pride ourselves on the quality of our reels, which are made with exclusive features that produce long-term strength, reliability and versatility to meet your specific needs. 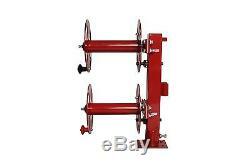 Gives you the option to weld or bolt your reel down to your mounting surface. NO plastic base isolators to worry about breaking in cold weather or rough conditions. We designed our reel with limited to NO fail points so that you can depend on your reel to work when you need it most. 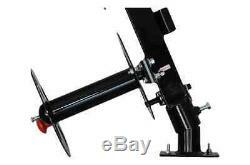 Swivel base allows for the reel to be turned 360 degrees in any direction of work. Stays connected to the welder at all times. Reel stands straight up providing a very small foot print. Vented circle design allows for free air flow over your lead to aid in cooling. Heavy-duty manual friction brake prevents free spooling of your leads during roll out. Locking pull pins prevent cable from unwinding. Mounts on any flat surface. 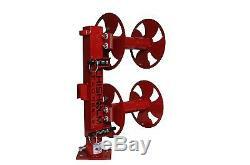 1/8 thick steel construction with ¼ thick base plates and reel mounting plates. All hardware is ZINC coated Grade 8. 10 diameter spool: 26.5 tall, 18 wide, 10 deep. 12 diameter spool: 27.25 tall, 18 wide, 11.5 deep. Based off how neat the cable is reeled up. 150 of 1/0 cable & 125 of 2/0 cable. 200 of 1/0 cable & 175 of 2/0 cable. 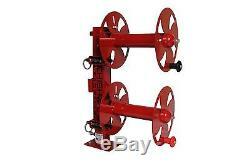 Comes ready to install on your welding truck, rig or shop. The item "12 RED Heavy-Duty SWIVEL-BASE Double Welding Lead Reel" is in sale since Tuesday, January 6, 2015. This item is in the category "Business & Industrial\CNC, Metalworking & Manufacturing\Welding & Soldering Equipment\Welding\Other Welding Equipment".leadreels" and is located in Mesa, Arizona. This item can be shipped to United States, Canada, Costa rica, Panama, Trinidad and tobago, Guatemala, Honduras, Jamaica, Antigua and barbuda, Aruba, Belize, Dominica, Grenada, Saint kitts and nevis, Saint lucia, Montserrat, Turks and caicos islands, Barbados, Guadeloupe, Cayman islands, Martinique, Nicaragua.